WASHINGTON — Top Congressional Black Caucus members said Sunday that Virginia Democratic Gov. Ralph Northam "has to resign" in the wake of his shifting explanations for a racist photo that appeared on his medical school yearbook page. 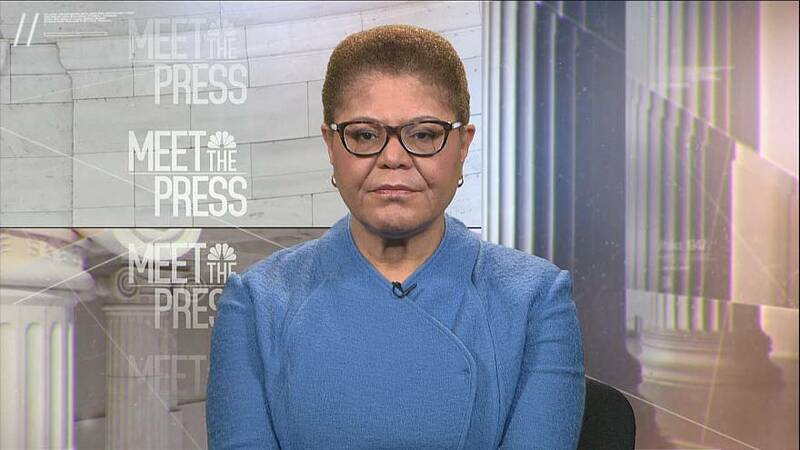 Appearing on Sunday's "Meet the Press," Rep. Karen Bass, D-Calif., the chairwoman of the CBC and Virginia Democratic Rep. Donald McEachin said Northam's answers have only made the situation more untenable since the photo, which shows one man in blackface and another in a Ku Klux Klan robe, became public on Friday. "He has lost the authority to lead, he's lost the authority to govern. He has to resign," McEachin said. "It's in the best interest of the commonwealth, it's in the best interest of the party." Bass criticized Northam as "completely dishonest and disingenuous" and dismissed the idea that by staying in office, Northam is forcing a conversation on race. "He's forcing the wrong conversation. What he should do is resign, and if he has any integrity at all, he should participate in that conversation," she said. Their calls echoed Democratic figures across the country who have called for the governor to resign since the photo surfaced. The governor initially apologized "for the decision I made to appear as I did in this photo" hours after the 1984 yearbook photos surfaced. But during a stunning Saturday press conference, Northam said that upon further reflection he realized he was not in the photo at all. He did admit that he once used shoe polish to darken his face while portraying Michael Jackson in a dance contest. Bass said that Northam's performance at the press conference only reinforced her belief he should resign. "He even acted at the press conference like he was willing to moonwalk until his wife stopped him, which shows he still does not understand the seriousness of his actions," she said. And Bass pushed back on Northam's defense that he's been solid on racial issues during his career in politics, arguing that he "backtracked" on his commitment to tearing down Confederate monuments in the state during his gubernatorial bid. In the hours after Northam faced the press, Virginia Democratic Attorney General Mark Herring, Virginia Democratic Sens. Mark Warner and Tim Kaine, Virginia Democratic Rep. Bobby Scott, House Speaker Nancy Pelosi, Democratic National Committee chairman Tom Perez and L. Douglas Wilder, the first black governor of Virginia, all called on the governor to quit. Previously, groups and individuals including the Virginia Democratic Party, a handful of Democratic presidential candidates, the president of the NAACP and the state Republican Party all called for his resignation. If Northam ultimately resigns, Lt. Gov. Justin Fairfax, who is black, will take over as governor. While Virginia imposes a one-term limit on their governor, Fairfax would be allowed to run again in 2021 because he would not have been elected by Virginians to a full term.